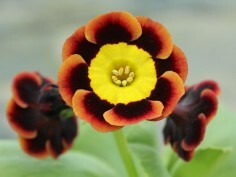 Alpine auriculas have brightly coloured, velvety flowers which are often slightly larger than the show types. The corolla outside the centre should be gradually shaded from dark near the centre to light towards to edge. They are sub-divided into two groups - gold-centred or light-centred. There is no farina on the flower or foliage which means they are happy being planted outside in a border or rockery as they will not spoil in the rain. If you are trying auriculas for the first time we often recommend the alpines as they are very showy but a bit easier than some of the true show auriculas. Fully hardy, happiest in a well-drained, part-shady spot which is not allowed to fully dry out, or in pots. 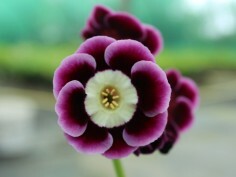 Culture: Please consult our information on growing Show auriculas.